In only the 3rd game of the season thanks to some pretty miserable weather, Stoneleigh played a Sunday match against a BBC Midlands team with a special guest player. 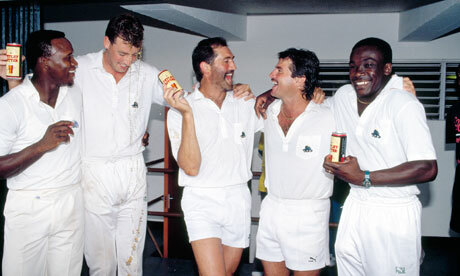 None other than former England test fast bowler, Gladstone Small (seen on the far right of the photo below back in his England days). Batting first, the BBC team reached a more than useful 175 off 40 overs thanks to a quick-fire 47 from Mr Small (only after being dropped 3 times….but we won’t go into that) This was a good score on a slowish pitch, and given that Stoneleigh had bowled tightly in the first 20 to restrict them to only 50 odd runs. This included a tight spell from James “run-maker”Whittingham early on in the innings. In reply P Chapman (47) and P Lazenby (15) put on 57 for the first wicket to give the home side a good chance of chasing down the target. However the middle order struggled to maintain the run rate against an experienced bowling unit and good fielding from the opposition. In the end, Stoneleigh only managed to get over 100 as batsmen came and went without any decent partnerships being made. It was a match played in a good spirit at all times and the opportunity to play against a former England player made the occasion even more entertaining. Seeing him flick a full length ball into the field with minimal effort shows just how easy these players can make the game look!